McDonalds is one of those companies where people want to know exactly how their food was made. And sometimes they need to do something not to get into the spotlight of a shitstorm. Now, the Australian team of McDonalds, with the help of DDB Australia, knows how to do some prevention – with their app “TrackMyMacca”. This app lets Australians have a look in the McDonalds kitchen (and before ingredients even gets there) of their meal. It dives straight into their supply-chain and augmented reality to transmit an interactive experience that makes McDonald’s delivery process transparent, “showing where your ingredients come from you are eating”. In my eyes, this is an interesting experience, and makes eating your burger alone a bit more exciting… and engages the customers. Ever thought about how you could do that with your product and services? Check it out and let us know what you think. According to a recent study by KN Dimestore and SocialVibe brand messages and incentives influences most consumers to pay more attention to ads. In fact, if companies combine these two advertising and brand strategies, the interaction of consumers with brands increases by 91% and brand perception by 38%. The study -which gathers data from more than 30,000 survey respondents- reported that when 48% of survey participants initially opt-in to engage with a brand for the incentive, they stay and pay attention to the brand message. The aim of the study was to find out if and why incentives prompt people to engage with the advertisements, how they affect consumer perception of the brands, and if they influence people to visit the company’s website or „buzz“ their friends about the offer. Respondents gave feedback on ads from U.S. brands across financial services, CPG, entertainment, e-commerce and technology categories between June and July of 2011. The results summary makes clear that engaging with the ad increased the odds that the consumers would purchase the product. Above that, incentives through ads drive website and in-store traffic, as well as purchases – and also conversions. Happy customers are coming back more often to the website when initially satisfied with an incentive through incentives. 36% of respondents were more likely to purchase brand-related products at physical store after interacting with the ad. SocialVibe names the strategy “value-exchange brand advertising”. The company defines it as ads that ask for a consumer’s attention in exchange for something they want, such as virtual currency for social games or making a donation to charity. There is a clear differentiation from sign-up and straight purchase intended offers like cost-per-action (CPA) advertising. The study is an interesting step in indicating the value of ads for branding. Generating consumer interest and awareness get’s more and more challenging these days with the masses of advertising we are faced with on a daily basis. 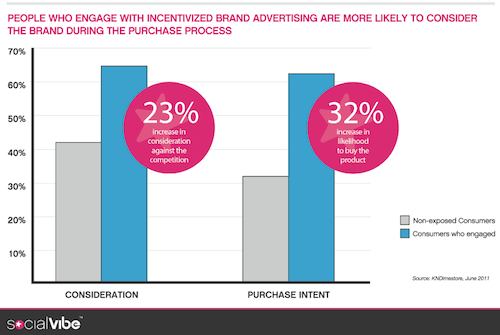 Mobile advertising shows some similar development in terms of incentivization and engagement. Often companies said that the value of ads is getting lower as they just value it from a conversion-based ROI perspective. However, the study now shows that earning points, virtual currency or some other rewards finds the atention of customers. That’s when conversion comes into play, and that’s where brands need to foster engagement to a purchase via the right communication tactics.